“A2Bism” — a term coined by Mikael Colville-Anderson of Copenhagenize — is the idea that bikes for transportation is such an everyday concept that you don’t even think of it. Think about your everyday car use — you don’t suit up in special clothes or worry about the route you’ll take. You hop in your car and go. This is the philosophy behind some current cycling advocacy which promotes cycling as an everyday, utilitarian mode of transportation. You don’t suit up in special clothes — you just hop on the bike and go. When Paul Harris of Canadian bike distributor KMI tried “A to B” bikes for the utility market at Interbike a few years ago, however, he thought the bikes all missed an important component: fun. He got together with experienced bike designer, dedicated urban commuter and mountain biker Jerome Roy to create an A to B machine that’s fun to ride, and the result is the Urbana Bicycle. I’ve previously mentioned some of the utility features on the Urbana: monstrous 2.6 inch tires eat Montreal’s potholes for lunch and dinner. The rack (120 lb capacity!) can hold and carry anything. For the dedicated commuter, build options include internal gear hub, kickstand, fender, rack, and chainguard for a true “hop on and go” utility bike. First, let’s talk about the Urbana “RNR”, which means ‘Reinforced Rack.’ This rock solid platform with 120 lb load capacity is amazing. Metal hooks provide handy mount points to wrap grocery bags. 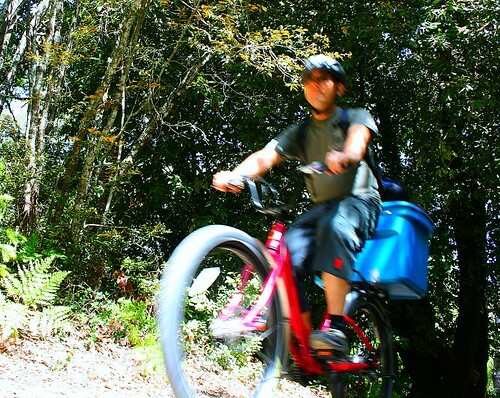 With a little ingenuity, the RNR can give longtail cargo bikes a run for their money. You can carry a nice load of groceries with this rack’s hook setup. Longtail cargo bikes are prohibited from my region’s rail commuter lines, but the short wheelbase means I can push this bike right onto the train. I bolted a big plastic bin onto the rack and loaded it up with 50 pounds of car camping gear for a family trip. Besides the extra effort required to start and go uphill, the laden bike handled great for the four mile trip to the campsite. On the return trip, my daughter and I took a scenic route that involved a two mile detour on sandy fire roads through the state park. My daughter wasn’t confident bombing downhill on rutted trails and wanted to walk down, so I strapped her 30 pound bike to the top of camping gear, resulting in a nice Jethro Clampett style pile towering over my head. In spite of the water bars, ruts, and roots across my way, there were no scary creaks or groans coming from the rear of the bike. I felt absolutely confident navigating this fully loaded bike over hill and dale and along the dusty trail. I wish I stopped to take a photo of this getup, but perhaps later I’ll reproduce this feat. (I later broke my plastic bin through circumstances that had nothing to do with the bike. I hope to have video of this soon, but I’ve discovered the Urbana bike and RNR are sturdy enough to surf on! The Urbana bike’s geometry with its slack headtube angle results in a lot of trail, resulting in interesting handling characteristics. When I lean the bike up against a wall, the front wheel flops around and the entire bike falls over; you may want the kickstand to prevent this. It takes a little more effort than usual to ride this bike no-handed, in spite of the wide tires. I’m not normally able to roll backwards for any distance on a bike, but on the Urbana it’s almost easy. Step through frames wobble because they lack a top tube; not so with the Urbana, though, with its ultra beefy frame and bottom bracket providing exceptional torsional stiffness. The Urbana is by far the stiffest U frame bike I’ve pedaled, and it handles hills, stairs, tree limbs, curbs, and the occasional unruly motorist with aplomb. No name 36 spoke wheels (Quando front hub; Shimano Nexus 8 speed redband rear hub) have stayed true and round through this abuse as well. Some people don’t care for Shimano’s roller brakes, but I found the Nexave roller brake coupled with Avid 5 mechanical disc brakes to work more than adequately through the Santa Cruz Mountains, even with the heavy camping load I hauled. 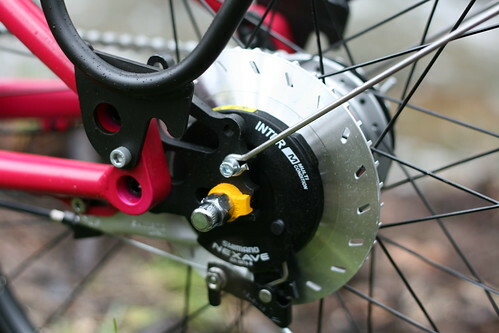 In the brake photo, you might also notice dropout hanger for the 8 speed hub. Mounts are also available for derailleur and singlespeed setups. V Brake mounts are also available for the rear wheel, though you need six inch brake arms to clear the monster tire and fender; I don’t know that length is available. SKS P65 fenders cover front and rear tire, with clever cutting and stay bends needed to mount them with disc brakes and the unique frame design. My pants and backside stays dry with these fenders in light California mist, but the extreme fork angle means the front coverage isn’t quite there, and that fat front tire flings a good quantity of water forward and up, which then flies right into my face. I had to slow down to see where I went in the rain. And oh, what wonderful tires. The 2.6″ Nid de Poule tires are made specifically for Urbana and are designed to soak up the bumps of Montreal’s crumbling streets. I wrote about them before, noting their ability to float on beach stand. The only real drawback — the bike racks mounted on my local buses are too narrow to accommodate these tires! Some transit systems use larger racks, however, so your mileage may vary. Shimano’s 8 speed Nexus “Red Band” hub is wonderful. The premium Red Band hubs feature improved bearings and lighter weight. Shifting with the Shimano Nexus grip shifter is smooth, quiet and quick. My wife normally rides a Breezer Villager and fits the ‘slow cyclist’ paradigm of low effort A2Bism. 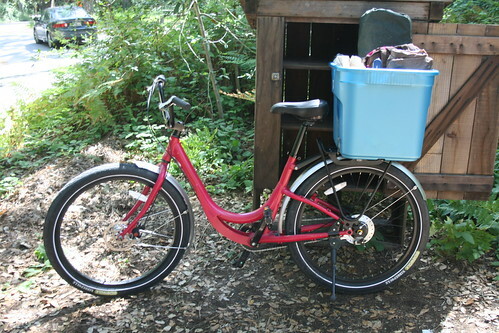 Superficially, the Villager’s utility features — U frame, internal hub gearing, fenders, rack — matches the Urbana, but she loves the Urbana review unit. The bike itself turns heads, and it’s not just because my wife normally cycles in a skirt. She and I both have received a lot of good comments from strangers, non-cyclists, and fellow bike nerds in Santa Cruz, who all wonder where this bike is from. I normally don’t write more than a couple of posts on a specific bike, but there’s so much about the Urbana. It’s an easy bike to love. Somebody could probably create a blog just on hacks for that wonderful RNR rack. The Urbana works well as an A to B utility bike, but Jerome Roy succeeded in designing in the ‘fun’ component. The extra wide tires and 42-pound weight of this bike means you’re not going to break any speed records, but taking it easy is simple to do with the Urbana, whether you take it down the block to the coffee shop or 20 miles on a Bike Party ride. The Urbana is the best errand getter bike I’ve tried. The Canadian Urbana is not quite yet available in the United States, but Urbana is working to develop their USA dealer network. Right now, you can buy Urbana from bike shops in Montreal, Toronto, Thunder Bay, Winnipeg, and Vancouver. Read Urbana Bikes on Facebook for user reviews of the bike. Fantastic and very thorough review. Thanks!